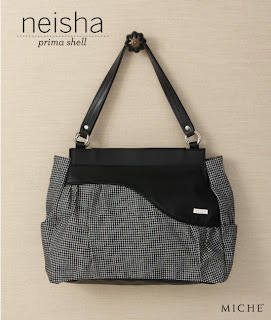 Neisha, Miche's Prima Bag just might be your new favorite cold weather Shell! Classic houndstooth fabric in a miniature pattern is flecked with the tiniest hints of silver—giving it a little touch of surprising sparkle. The pièce de résistance is the dramatic black faux leather wave detail across the top. Be still my heart—this gorgeous Shell is perfect with just about any outfit!